I have two plants on the draining board in my kitchen. One plant - a Begonia - has had a rough time over thelast five or six years. I bought it in a garage on the way home from the theatre. After flowering once, it went into a steep decline and broke off from it's roots. My first reaction was to put it in the bin, but I just couldn't, not while there was life in it. I stuck the rootless stem back into the soil and for the next five years it did little other than just hang on in there. Then last Christmas, my other plant, an anonymous specimen, decided to flower. 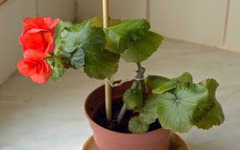 One night, after watering the mystery plant, I left it with the feeble begonia. I don't know if it was love, envy, or copycat behaviour, but the begonia started to grow. 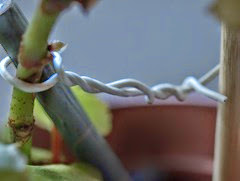 ...Then one night around mid January, I noticed a tiny red bud. The buds multiplied and started to flower - It took two months for the buds to fully bloom - and now I see there are three new buds preparing for their slow-motion debut. Give out good vibrations. What works for your pot-plant could work for humanity. henry-This is beautiful. What a patient man you are. Thanks for reminding us that what we give out, we recieve. The flowers truly represent that we are all alive and connected. Oh this made me teary. Love makes magic. This is a fabulous reminder that with nuturing and kind words even the most downtrodden of us can be bought back to life again. Makes me want to be kinder to everyone for some reason. How have you been Henry? Spring is on its ways for you and thats always a great thing. I forgot this sideblog was here. Now I have to visit your others. I loved reading about this as everyone else that has commented...patience and kindness are beautiful things! Henry, your post is insightful and full of hidden wisdom between the leeter,s words and lines. Plants are much like children. Their innocence and powerful core energy vibrations offer lessons in renewal and self-care. Adults learn much about how to remove their own layers of self-deception. To get back to basics is encouraged by all Mother Nature's creatures. Nonetheless, not all creatures choose to listen. Hi Everyone ~ sorry I haven't responded sooner, but I have been to see Liz and the internet reception is so bad there - it takes around 15 mins to load a page! Hi Janet ~ Thanks- we are really all connected, for good or bad. Dearest Lilly ~ I'm very attracted to small vunerable things 'hamsters, plants, birds...especially if they need taking care of. Hi Robin - I love what you say about the 'family groups' and symbiotic relationships of plants. And I really love your comment on my video. Hi Liara ~ I think I am learning a lesson on simplicity from you. Thank you. Discerning spiritual limitations enables you to step outside them and take more active control of the direction of strengthening connections. Your world is transforming in ways you are only beginning to register on unconscious levels. The plants are sentient and send you energy too. I agree that it's hard to give up on a plant that is not thriving, and have often found that thinking carefully about its needs and providing for them gets a fantastic response, after all, they don't want to die. You gave this plant all your positive thoughts and made such a thoughtful effort, and a little thought (backed up with action) is all that's needed. The video is precious with all those beautiful little spring flowers especially! This story is another one of those outstanding moments that takes my breath away. You couldn't throw it out - I completely understand. I have two young maple trees in the backyard that were there since we moved in and they haven't grown one bit, the first year we were here, they barely even sprand leaves, and whatever they had, they lost by mid-summer. Anyone else would have dismissed them and replaced them I imagine, but I went out and touched them and believed in them and by the third year, a bunch of new shoots sprang forth in mini maple trees near the ground from one. It looked so bushy and beautiful. And this year I intend to spend even more time with them. Your flower story is so inspirational Henry and just as you saw this frail little one come back I am seeing those results with these trees too. And yes I know and can imagine what happens when we treat ourselves, humanity and all of nature like this...miracles! The twin souls of these plants in your post almost jumped into my lap. Theri enthusiasm convinced me to buy them from a garden centre and give them as a healing gft to a young friend recovering from colon cancer. She sees the health experience as a real blessing in disguise. What a trooper! Thanks for the lesson in the timeless power of synchrony.